Thor’s NTD Filming | Give That Dog a Job! 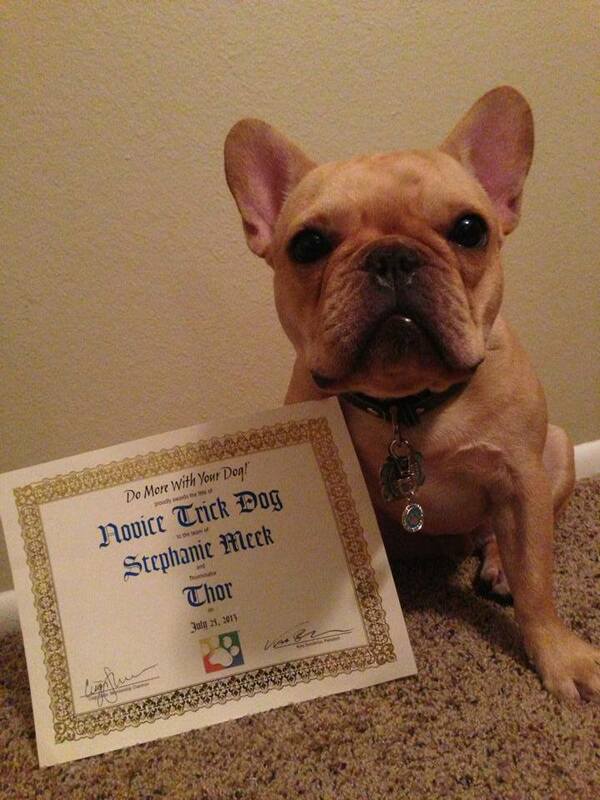 March 23, 2015 March 26, 2015 ~ Steph M.
Later I did record the video “Thor the French Bulldog’s 15 dog Tricks” but I always planned on making a video of his title and this time filming it correctly! He was able to do each of the tricks and I think he enjoyed showing off for the camera but a few things popped up that we will definitely need to work on. Namely we need to get better work ethic, I need to stop cheating to help him succeed, distance, and I really need to get more solid hand signal/ verbal cues since at multiple points he seemed to get a bit confused on which trick I was asking him to do. The tricks Thor did to earn his NTD are: sit, down, come, stay, doggy push ups, food refusal/ leave it, hand signals (3 tricks), jump over a bar, paws up on a object, roll out a carpet (we used a yoga mat), shake hands, speak/ bark on cue, spin circles, take a bow, and treibbal (pushing a ball). I threw in a sit pretty/beg since it is one of his favorite tricks and he does it with so much enthusiasm. < Previous Give your dog a goal? Next > National Puppy Day!